Material Safety Data Sheets are forms required by the federal government containg information on safe handling and storage practices and emergency procedures. Our goal is to provide you easy access to the MSDS info on products we manufacture. If you need MSDS forms for products not listed, please feel free to call, email or write to us. We are required to provide MSDS/SDS sheets on the products we manufacture at Georgies. We are also required to provide MSDS/SDS sheets on the raw clay and glaze ingredients we carry. We keep these sheets on file, and we're happy to provide them on request. MSDS/SDS sheets for many common materials are also available from the computers of the Oregon State Fire Marshal. Clicking this link opens the Fire Marshal's searchable MSDS/SDS database in a new browser window on your screen. If the link doesn't work, you may need to adjust your browser contrls to allow our website to open a new window. At Georgies, we urge you to test our products before use to determine their suitability for your purpose or your project. We also urge you to be conscientious in determining any risks associated with specific ceramic materials. We support your efforts by supplying in good faith information, derived from reliable sources, that we believe to be accurate. 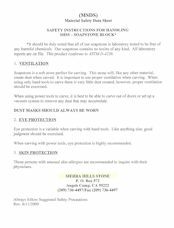 The safety information on these pages is a summary presentation, and not intended to be exhaustive in detail. If you have specific questions or concerns, we would be happy to supply further information on request.